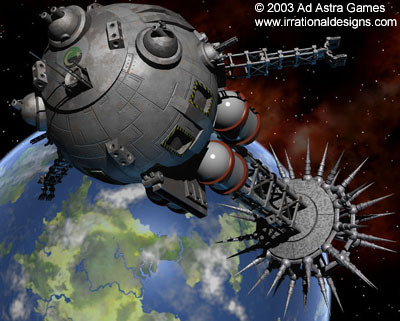 This is a gallery attempts by Winchell Chung to import a CGI model by Charles Oines for a wargame called Attack Vector: Tactical into a program called Orbiter. It all started with the coolest, most scientifically accurate, and elegant paper-and-cardboard wargame ever, Attack Vector: Tactical. The ships are based on real physics, the game universe is exhaustively modeled economically, politically, culturally, and astrographically. What's not to like? I've been working off and on with the designer and his team for a few years now. You can find some sample material here. Then I encountered Orbiter. This is a freeware Windows program that is a spaceflight simulator. The program is just one step down from NASA quality space mission planning software. Orbiter has a thriving community of fans who enjoy the heavy number crunching involved with orbital mechanics and whatnot. Just the sort of people who would be interested in Attack Vector. Oh, did I forget to mention that the file format for Orbiter spacecraft was open-source? There is a large number of third party "mods", adding spacecraft from Vostok to Delta Clipper to SpaceShipOne to 2001 Discovery. A little light bulb went off in my head. Like an innocent fool, I suggested this in an Attack Vector forum. And of course I got sucked into the project. I was entrusted with the Lightwave mesh model of the "al-Rafik" frigate starship from Attack Vector, crafted by master CGI artist Charles Oines. Now all I have to do is convert it into Orbiter Format. I had gotten my feet wet with creating Orbiter mods, playing around with doing the good starship Leif Ericson and its scoutship. I'm getting close, but it has not been easy. You see, Mr. Oines mesh was optimized to produce stunning camera-ready artwork. The mesh contains over 140,000 triangles. Unfortunately meshes for Orbiter have to be kept down to about 15,000 triangles or the animation slows to a crawl. Using the amazing freeware program Blender, I've chopped, and pruned the mesh. So far I've got it down to 32,000 odd triangles, which is close but no cigar. It has been an education, I've learned a lot about mesh modeling by examining Mr. Oines mesh under high magnification. It breaks my heart to savagely remove detail, but we do what we must.